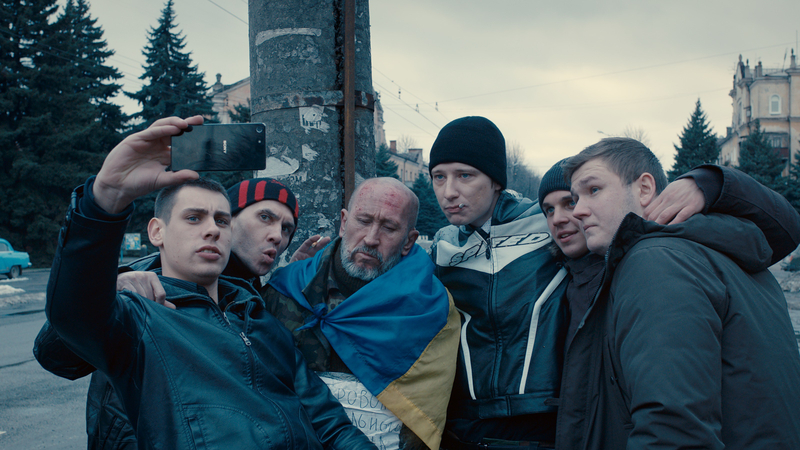 Ukranian director Sergei Loznitsa is back on the Cannes Croisette with a superior effort to last year’s Palme contender A Gentle Creature, though his new film Donbass was selected to open the Un Certain Regard sidebar. Loznitsa is an artist who likes to switch between found-footage documentaries, shorts and fictional features. With Donbass, the director has mixed aesthetic forms for what often plays like a nightmarish mockumentary about nationalist identity and the often frightening daily occurrences and hardships dominating the Donbass region of the Ukraine, where pro-Russian citizens and militias battle against the ‘fascist’ government. The distinct blurring between fact and fiction begins immediately with an actor sat in a trailer, having makeup applied and moaning about her lot in life. But it isn’t a movie-within-a-movie that we’re seeing, but the commencement of a propaganda video detailing the savagery of the Ukraine government as it blows up those who identify as ethnic Russian willy-nilly. The film’s displays of humour give away to harsher scenes of brutality and intense moments where rural calm is suddenly disrupted by mortar explosions and transformed landscapes dotted with corpses. The main character in Donbass is the camera. As it moves like a passive observer, akin to Dante in The Divine Comedy, going from situation to situation episodically – sometimes scenes are absurd and sometimes they are deeply disturbing – the unique take on narrative structure falls somewhere between The Fast Show, an atrocity exhibition or a Breughel painting documenting hellish torments; the accumulative effect a grotesque comedy of errors and terrors, which ultimately is no laughing matter. Figures come and go, the focus always shifting and rarely are people given names or identified beyond their role and function – militia commanders stealing property under the guise of ‘for the war effort’, a German journalist harangued for his country’s Nazi past, bored soldiers eating gherkins on a tank, old ladies inciting violence and louts who’ll take selfies with captured enemy agents tied to lampposts. The latter scene is the movie’s cruelest and most unpleasant. Forced to stand before the general public, a handwritten sign hanging around his neck announcing he was part of an extermination squad who killed children and set landmines in fields, the beleaguered and humiliated soldier is mocked, punched and then severely beaten, the handheld camera among the scrum of people aiding the sense of savagery and unhinged hatred burning among the townsfolk. It’s a scene, too, which best highlights there are no winners in the bitter divide between pro-Russians and the rest of the country, as it continues to struggle between its historic allegiances to the Kremlin and, in more recent times, the EU and the West.